2014: Pelham Preservation Soceity raises awareness and successfully opposes a proposed re-zoning of "Four Corners" to allow for six-story apartment buildings; the annual fundraiser is held at the home of Nick and Katy Loria; funds are provided to repair and restore the Pelhamwood Clocktower on Harmon Avenue. 2013: Annual fundraiser held at the home of Blake Bell & Janice Ingram at 20 Beech Tree Lane; the organization raises awareness, garners community support and works with the Pelham School District to add substantial greenspace to the PMHS Corlies Avenue Parking Lot. 2011: The organization holds its annual fundraiser at the home of Greg & Adrienne Coleman, raising funds to improve parkland on the Boston Post Road and the restoration of the oculus window at the Pelham Picture House. 2010: Pelham Preservation Society holds its annual fundraiser at the home of Dan & Carleen Murdock, raising funds to complete the Pelham Memorial High School Lobby Project. 2009-2010: The organization adopts as its signature project for the next two years, the restoration of the lobby of Pelham Memorial High School, one of Westchester's most significant Collegiate Gothic buildings; the annual fundraiser is held at the home of Jennifer & Ian Lapey, which turns out more than 350 people in Pelham Preservation Society's most significant fundraiser to date. 2008: Fundraiser held at the home of Rob & Lori Anziolotti; Benedict Fountain work is commenced, including repair and re-pointing of the steps to Benedict Place. 2007: Fundraiser held at the home of Jennifer & Matthew Meyer raises sufficient funds for the organization to undertake an ambitious project to restore the Benedict Fountain and Steps on Pelhamwood Avenue. 2006: Fundraiser held at the home Dimitria & Eric Holland; historic plaques installed at various homes throughout the Town of Pelham; additional landscaping installed on the northwest corner of the Pelham train station. 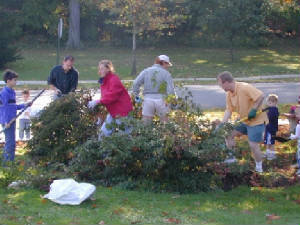 2005: Fundraiser held at the home of Barbara & Jeff Goodman; restoration of the Highbrook Gates is completed; additional landscaping provided around the Pelham train station; applications received for historic plaque program; position taken against the conversion of a portion of Ingall's Field to become a parking lot. 2004: Fundraiser held at the home of Mark & Ellen Tuttle; Landscaping is completed in areas around the Pelham train station, including along First Street and the traffic circle on the south side of the station; structural and slate roof work completed on the east-side Highbrook Gate; Fifth Annual "Plant Pelham" Day is held at Memorial Park. 2003: Fundraiser held at the home of David & Brenda Harms; Fourth Annual "Plant Pelham" Day is held with 8,000 daffodil bulbs planted at the Sixth Street Playground. 2002: Start of the "Pelham By Design" library collection of books on architecture, preservation & gardening; Third annual "Plant Pelham" Day is held with 4000 daffodil bulbs planted around the Pelham Memorial High School and Middle School. 2001: The first fundraiser is held at the home of Victoria & Joe Klein to raise funds for the purchase and installation of brackets and hanging baskets on lightposts along Pelham's Fifth Avenue downtown area; Second annual "Plant Pelham" Day with 2000 daffodil bulbs planted along the village park on Wolfs Lane. 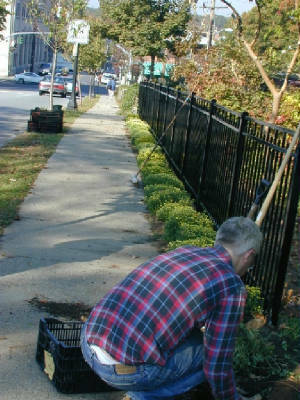 2000: The organization expands its mission to include gardening and adopts the name “The Pelham Preservation & Garden Society;” a new historic fence (donated by Gun Hill Fencing) is installed along Pelhamwood Avenue and the first annual “Plant Pelham” day is held with 1,000 daffodil bulbs planted in the greenspaces around the Pelham train station to beautify the area. 1999: The Pelham Preservation Society is incorporated under the laws of the State of New York. 1998: The Pelham Preservation Society is founded by Pelham citizens dedicated to preserving the historic architecture and character of the Pelham community.